Mel: Are you going to go out with him? Mel: Why not, he was so nice. Ally: Mel, be serious, I can’t go out with him he’s 38 years old. Mel: He doesn’t look 38. Ally: Mel, Joe is already an ajosshi, this guy is an a-a-a-a-a-ajosshi. Ajosshi means older friend or uncle who is not actually related, commony used for older men. I guess she was adding more As for each year he was older than Joe. Suffice it to say, I don’t think she’s going out with him. Ally and I went out for Ice Flakes the other night, that is where the infamous ajosshi conversation took place. There is a place called Can More, around the corner from my apartment. They specialize in Iced Drinks and Ice Flakes which is the Korean take on snow cones. Ally had “rainbow sherbet ice flakes” which looks like a big fluffy cottonball. 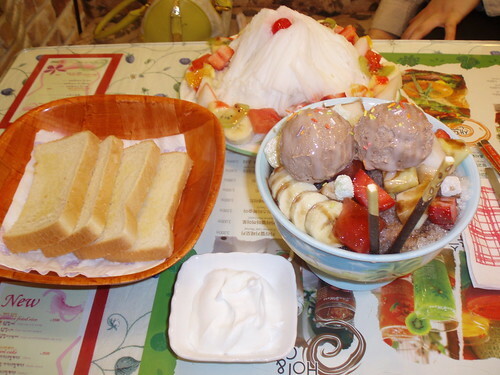 I had “choco ice flakes” which was pretty gross except for the two small scoops of real ice cream on top and the fruit they serve with it. As you can see your ice flakes are served with buttered toast and a side of whipped cream. Weird huh? On a side note, I was in Suwon the other day and on my way home I took a wrong turn and got back on the highway in the wrong direction. 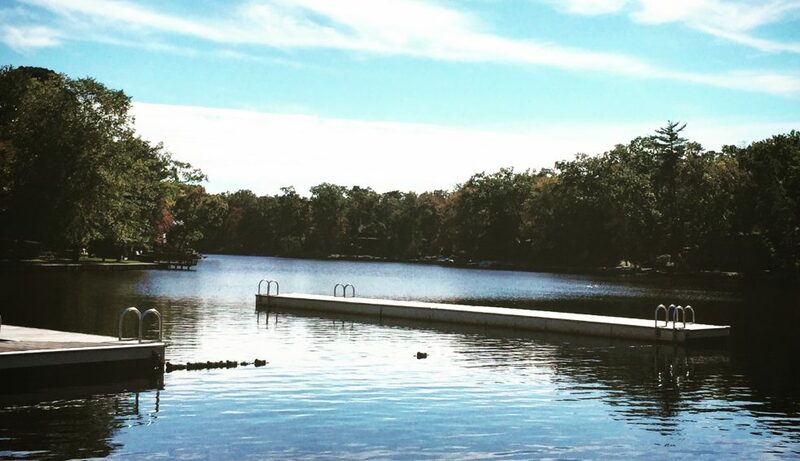 This is where I ended up. 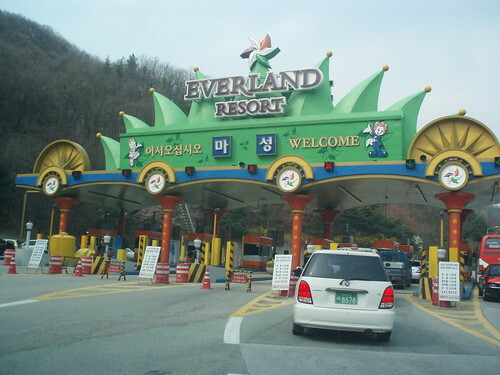 Everland, Korea’s answer to Disney World. This is quite possibly the closest I will ever get to Everland. I easily made a U-turn at the toll booth and headed back to Songtan. 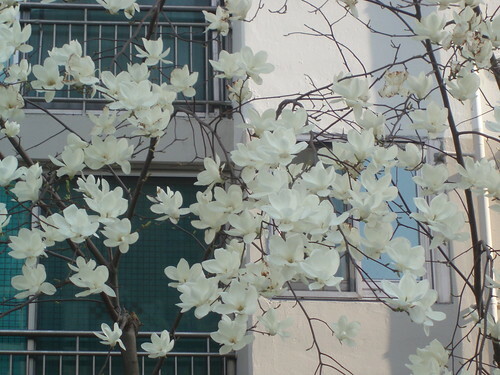 It’s magnolia and cherry blossom season here in Korea and everywhere you go you see amazingly beautiful flowering trees. 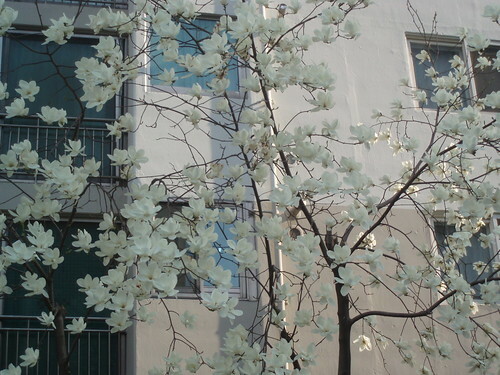 This is a tree outside my apartment building that has just bloomed and I love to walk past it on my way to town. Those ice creams looked nasty! But I have to tell you how much I LOVE the cherry blossom trees in April and May… it’s the most beautiful welcome of spring!